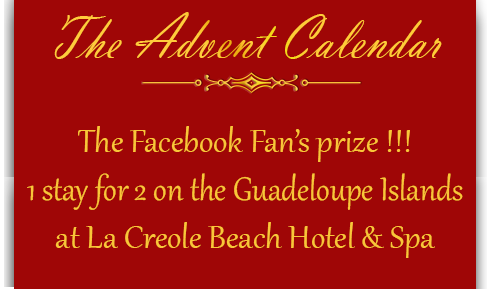 Win a stay on THE GUADELOUPE ISLANDS at LA CREOLE BEACH HÔTEL & SPA for 2 persons. With the hotel chain Des Hôtels & Des Îles, discover all the charms of the Guadeloupe Islands. This contest will run from the 1st December 2016 to the 25th December 2016 12:00 PM (GMT+1). To participate in the contest, the participant just have to like or/and comment the post dedicated to the sweepstake on the Facebook "Hotel & French Caribbean Islands" page between the 1st December 2016 to the 25th December 2016 12:00 PM (GMT+1). The participants can only enter once with the comments. A stay of 5 nights with accommodation in a Superior category room with american breakfast. Value of the prize: $US1460. No financial compensation in the event of non use of the prize nor refund. The prizes are not marketable, are non-transferable and subject to availibility.